Eid ki seviyan/semiya (vermicelli) is a very popular traditional dessert, which is served during Ramzan, Bakrid and other special occasions. Eid is incomplete without the preparation of this meethi seviyan (sweet vermicelli). Eid is a celebration of food with family and friends together. In India, when Eid is celebrated, the whole month or the time when Eid is nearing, you can see varieties of delicious food all around the market place (especially near mosques or Muslim community) during evening times, the aroma of which will be irresistible to us. People buy a lot of food from these markets for iftari (to break the fasting at home or in the mosque) or just to enjoy the food with family. A special seviyan is used to prepare this dish, which has to be very thin and orange or amber in colour (not the ordinary vermicelli). The texture of this seviyan is not very thick and dry, it is like a thick soup. In shops, you get both roasted and unroasted vermicelli. This time in this recipe I have used roasted vermicelli, which I have roasted again in ghee to enhance the flavour. During Eid, I have tasted so many varieties of seviyan prepared by my grandmother, aunties and other family members. During my child hood, I used to see my mom and my grandma, preparing seviyan in a very big vessel (apart from biryani) not only for us but for the relations, friends, neighbours and also the poor. As soon as when the men come back from namaz (eid ki namaz), eid ki seviyan is served to them in a bowl. It is also served to all those who come and visit us to greet at home. 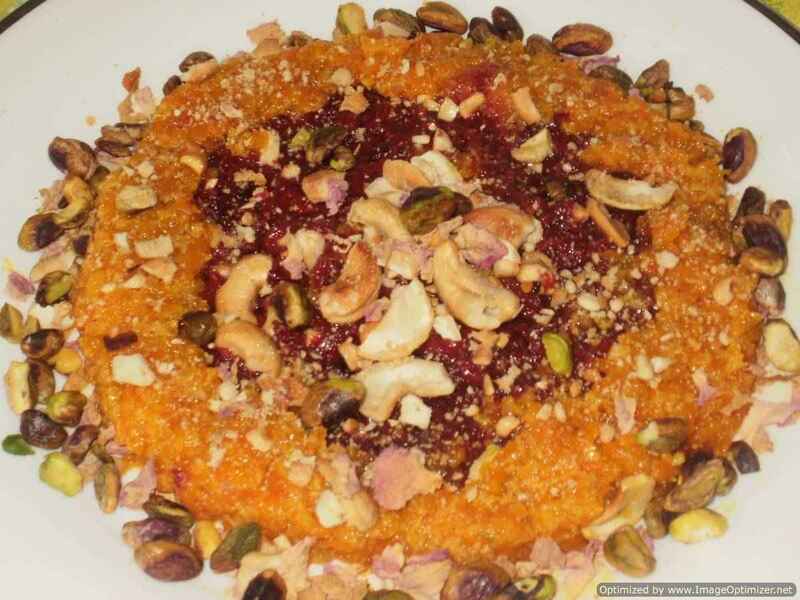 Eid is a time of joy, happiness and togetherness and this seviyan is a perfect treat to add to the joy. I have used readymade roasted vermicilli in this recipe. Although, the vermicilli is already roasted, I have roasted again to enhance the flavour. In a non-stick pan, add 1 tsp ghee and when warm add the vermicelli (seviyan). Roast on a low flame for a few minutes until the vermicelli is lightly roasted and infused with the flavour of the ghee. The vermicelli absorbs all the ghee and the colour changes. It will just take about 2 to 3 mins. Switch off and transfer the roasted vermicelli to a bowl or plate. Clean or wipe the vessel with a kitchen tissue or cloth. Heat the vessel and add the remaining ghee. When the ghee is warm, add all the nuts and raisins (except almonds). When the colour changes and the raisins swell, switch off and transfer to a bowl with all the ghee. Keep a few dry fruits and nuts for garnishing in the end. Boil the milk in the same vessel. Add sugar, 1/4 tsp green cardamom and mix well. Keep stirring over a medium to low flame, until the sugar melts. Cook until the raw flavour of the milk has diminished and until the milk has reduced and slightly thick. It will take about 10 to 12 mins. Keep stirring the milk in between to prevent it from sticking to the bottom of the pan. Keep scratching the dry milk which gets formed on the sides of the pan. Add the remaining green cardamom powder (a pinch). Mix well and cook for about 2 mins. 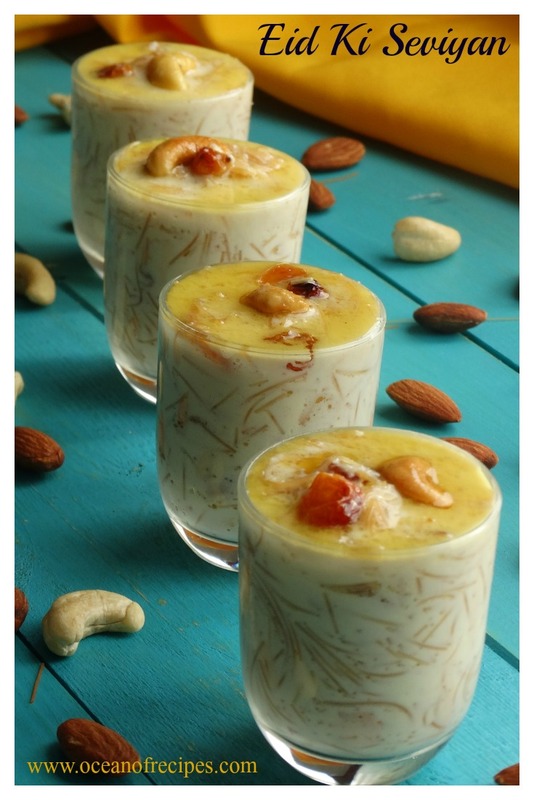 Add the roasted vermicelli and dry fruit and nuts (with the ghee) to the thickened milk. Mix well. Cook for a few mins on a low flame, until the vermicelli is cooked (the thin vermicelli gets cooked really fast - you can check by pressing with your fingers or you can even taste and see). It will take about 5 to 8 mins. As soon as the seviyan is cooked, thickened to the desired consistency, switch the heat off. Close the lid and allow to rest for about 5 mins or you can serve immediately if you want to. While serving, garnish with the remaining dry fruits and nuts. You get two varieties of vermicelli in the shops - roasted and unroasted. The pictures below show how they look. The darker one is roasted and the lighter one is unroasted. For larger quantities, you can just double the quantities of all the ingredients and add sugar as per taste. Serve the seviyan warm or at room temperature. If you want, you can add green cardamoms (4, lightly crushed) instead of green cardamom powder to the milk while cooking. While roasting seviyan in ghee, you can add 2 green cardamoms and roast to infuse the flavours of ghee and cardamoms into the seviyan. When the seviyan is added to the milk, it looks as if more seviyan (vermicelli) is needed, but when the seviyan is cooked, it thickens and becomes even more thick as it cools down. So, be careful in adding seviyan in milk.